The beet greens should be cut from the roots, leaving a bit less than an inch attached. Set the greens aside while you prepare the roots. Scrub, rinse, and dry them, then rub with coconut oil and wrap tightly in an aluminum foil or parchment packet. Pop in the oven and roast for an hour for large beets. Check for tenderness by unwrapping (careful—steamy!) and prodding the center of a beet with a small knife. Let stand until cool enough to handle, then, using gentle pressure, slip off the skins. Cut beets attractively. To make the dressing, mix miso, vinegar, and honey, and then whisk in 3 tablespoons oil and water. Taste, and adjust seasonings, salt may not be necessary, as miso can be salty. Wash the reserved beet greens well, and chop them crosswise, coarsely (if stalks are very large, separate from the leaves). Heat 2 tablespoons oil in large skillet over medium-high flame. Add shallot or onion and saute until wilted and tender. Add beet greens (give the stalks a 3 minute head-start, then add the leaves, if you’ve separated them) and toss them around until they begin to wilt, cover, then turn the heat to medium low and cook until tender, about 10 minutes all told. 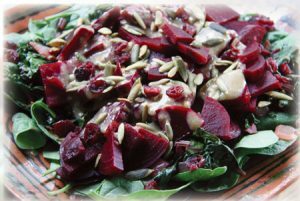 Just before serving, make a bed of spinach leaves, arrange the beets and greens over, drizzle on dressing and sprinkle on toasted seeds (and optional cranberries).